Pakistan lost a wicket in the last over of the day to hand the initiative back to Sri Lanka in the first Test match. Pakistan batsmen, resuming the day on 64 runs, finished at 266 for the loss of four wickets, still 153 runs behind Sri Lanka. Azhar Ali (74) holds the key as the J Junaid Jamshed Cup 2017 series enters Day 4 on Sunday at the Sheikh Zayed Cricket Stadium in Abu Dhabi. Azhar also completed 5,000 Test runs - the quickest among eight Pakistani players in terms of time taken and the fourth quickest on innings count. The proceedings of the day, though, started on level terms. Apart from the difficulty to read Lakshan Sandakan's odd googly, both the Pakistani openers - Shan Masood and Sami Aslam - together for the first time - were a picture of calmness till their stay lasted on the crease. Masood caressed Sandakan for boundaries to reach his third Test fifty. He was, however, dropped on 51 by Dimuth Karunaratne in the slips, which lobbed from the keeper's thigh. So far this year, Lankan fielders have dropped scores of catches. Luck was certainly with Masood, who had made his debut at this stadium in 2013. The duo got to their 100-run partnership in the 14th over of the day. 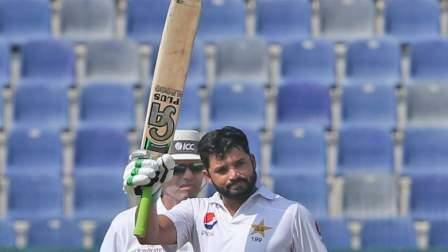 Aslam reached his sixth fifty, but yet again, was unable to convert it into a big innings. Dilruwan Perera trapped Aslam in front of the wicket to end a 114-run partnership. Sri Lanka had to review the decision as umpire Nigel Llong couldn't pick the ball thudding into the pad first. And a ball later, Llong gave new batsman Azhar Ali out leg-before. It was, however, on review found to have touched the bat first. Two decisions, both close calls to make for Llong, were overturned in the same over. Two hours into the day, spinners were beginning to find enough teeth to bite. And Rangana Herath, the veteran, snared one with a setup. Herath bowled off-stump line for most part to Masood, who went for a meditated sweep but the delivery was on the middle and went onto disturb the timber. Masood fell for Herath's trap and returned after a fighting 59 off 148 balls. There was drama in the last over before lunch break. Sandakan got Asad Shafiq with a wrong one. The left arm chinaman foxed Shafiq and keeper Niroshan Dickwella stumped swiftly. However, it was a debatable call by third umpire Ahsan Raza, who gave the benefit of doubt to the batsman despite nothing appearing behind the crease. Azhar and Shafiq had lunch with Pakistan at 121. Both the batsmen continued with great caution. The plan was simple - wait for loose balls. And Shafiq took two boundaries of Sandakan to bring the pair's 50-run partnership. The sleepy but secure partnership had skipper Chandimal thinking. He tried Sandakan from both the ends but elusive break continued to elude the Lankans. Azhar at 32 runs reached a milestone of 5,000 runs. He reached the landmark in 7 years, 2 months and 17 days. The previous record was of Mohammad Yousuf at 7 years and 337 days. Pakistan added 73 runs and took tea without losing a wicket. The partnership was broken with first over of spin after the break. Shafiq needlessly ticked onto Herath's delivery for Lahiru Thirimanne to complete a low catch at slips. It ended a productive 79-run partnership. Azhar, meanwhile, got to his 26th fifty with a push to mid-on. Even as runs dried up, Azhar found boundaries whenever the opportunity existed. But towards the end of the day, the pair almost forgot to score. The lack of action seemed to have led to laxity as the last over of the day saw Babar Azam follow Nuwan Pradeep down the leg side and edge it for keeper Dickwella to gobble the catch. The last-over wicket has titled the balance in favour of Sri Lanka going into the penultimate day of the Test.